This week I had intended to make different recipes than those below but I found I didn’t have some of the ingredients I needed. I was at home on Monday and couldn’t quite face going out shopping in the cold so I opted to just use things I had in the fridge, pantry and garden. Fortunately I’d bought a good selection of vegetables from Jason and Fresh Gardens, bacon and speck from Marty, eggs from Nature’s Corner and Wade of L’Authentique had given me a pack of his delicious sausages. I ended up with these two recipes – real comfort food!! I’d never made bubble and squeak before – a traditional English dish made with left over vegetables particularly potatoes and cabbage. 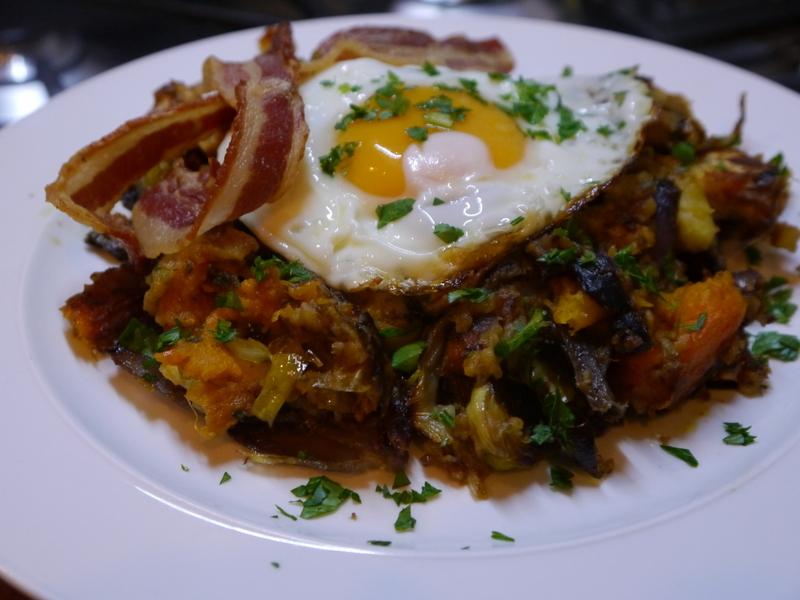 In this case I took the idea of bubble and squeak, didn’t use leftovers but instead roasted vegetables especially for the dish. It’s great as brunch or even a simple dinner. Use whatever veges you have at hand in whatever quantities. While the veges are in the oven, boil the potatoes. Once soft, drain and mash them adding the crushed garlic, a good knob of butter, a little milk and a handful of finely chopped parsley. Season. Let all the veges cool then mix the oven roasted ones into the mash using your hands to make sure they’re well blended. Heat olive oil in a large heavy frying pan. Add the vegetable mixture flattening it down to fill the whole pan. 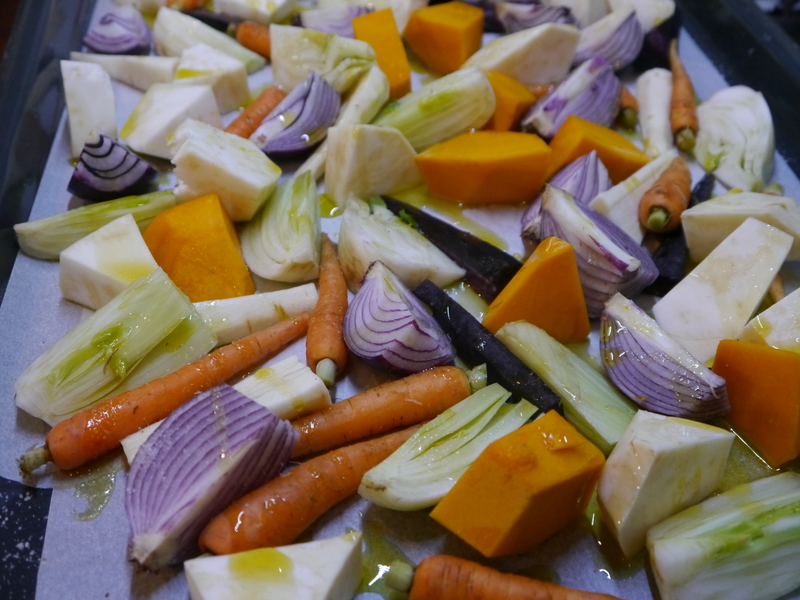 You want to try and make a crispy brown bits on the bottom on the veges and then turn them over. Don’t worry if it all falls apart as you turn it. Add more olive oil if you feel it needs it and/or a knob or two of butter. While the bubble and squeak is cooking cook a few rashes of bacon and fry some eggs. Serve these on top of the bubble and squeak.